“I can never stand still. I must explore and experiment.” These are the words of the infamous Walt Disney. Kids love to explore and learn about the world around them. They want to use all their senses to understand how and why things work. To me, this is the essence of the STEM movement. STEM stands from Science, Technology, Engineering and Math. You may have also heard of STEAM, which has added Art to the mix. Developing skills in these areas are not only needed for academic success, they also help kids in all aspects of life. At Toy Fair NY 2015, we learned about some amazing STEM/STEAM toys and products that kids (and adults) will LOVE! They offer hours of fun and exploring while enhancing important academic and life skills. There were so many toys at Toy Fair that it was hard to narrow down the list so please know this list is in no way exhaustive. Think of it as a jumping off point in your exploration of the STEM and STEAM world! Safari Ltd. creates amazing figurines of different collections including (but not limited to) farm animals, sea creatures and dinosaurs. If you have read any of our sensory bin posts, you will know that we talk about Toobs which is a collection of these tiny figurines. 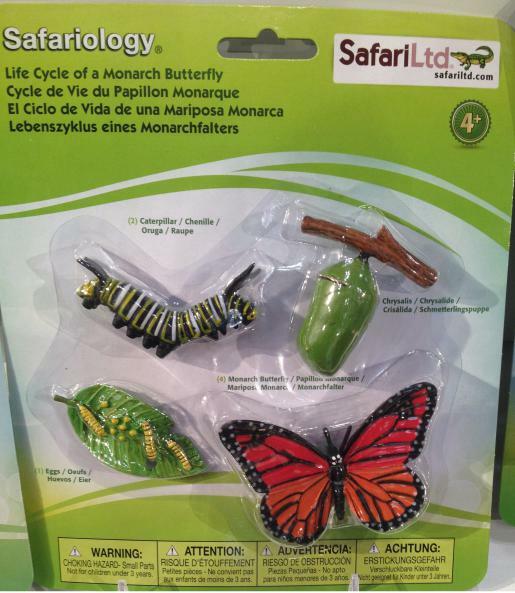 In this article, however, we wanted to highlight the Safariology Kits which review the life span of an insect or animal such as an ant, butterfly or mosquito. Safari Ltd. are meticulous with their details meaning everything you see is an accurate depiction of the real animal. In addition, information presented on the product is listed in four different languages which opens the door for more families to engage with this toy. If your kids love to learn about space, then this is the toy for you! Little astronomers will learn all about the real moon including its phases and solar eclipses. The Super Moon automatically syncs with the real moon outside! By using the remote, kids can click through all 12 lunar phases as well hear moon landing sound effects. What a great multi-sensory learning experience! We love the GeoSafari Jr. Collection as it combines outdoor play and science in a way that makes learning fun and easy. 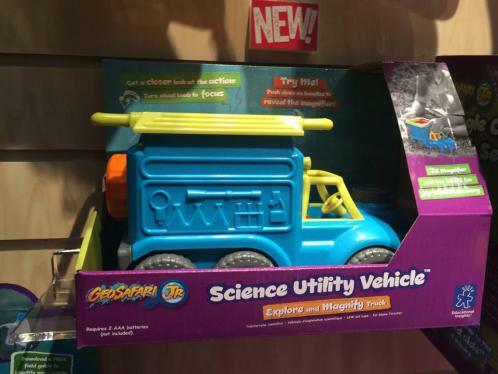 For example, the Science Utility Vehicle has a magnifying glass on the bottom which allows children to explore nature while they push the truck around. Kids will also love the Bright Eyes Magnifier, BugOpticals, Aquamagnifier and Underwater Sound Scout. Every product in this line will keep your child engaged and intrigued by nature and science. Educational, fun and slightly gross, The Squishy Series definitely grabbed our eyes and hands at Toy Fair 2015. There are several options in this awesome series. The Amazing Squishy T. Rex is a plastic mold of Tyrannosaurus Rex where one half is clear so children can get a peek inside to see its organs. 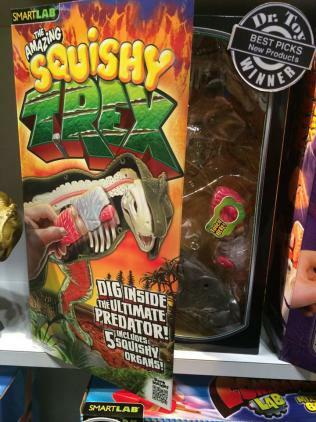 (Check out our review of Squishy T. Rex here.) They can then open the carnivore up and see his internal organs. Kids (and adults) will also like the Inhuman Squishy Zombie and the Squishy Human Body where a child can remove the intestines as a whole or in one big line. The Squishy Series is a great way to teach kids about the body while still having fun! SmartLabs has a fun and tactile collection that will engage children while they learn. As a big fan of science and Star Wars, how could I not LOVE the Star Wars Science line from Uncle Milton. This company is phenomenal at integrating pop culture films with educational toys for endless fun, and the Star Wars Science line definitely mirrors this philosophy. With the Mustafar Volcano Lab children can learn and create their own volcano, while the Death Star Planetarium has different options so you can rotate between our solar system and the Star Wars Galaxy. Star Wars fans will also love the Jedi Force Levitator, Lightsaber Crystal Growing Lab, Millennium Falcon UV Light Blaster and Galactic Battle Wonderscape. 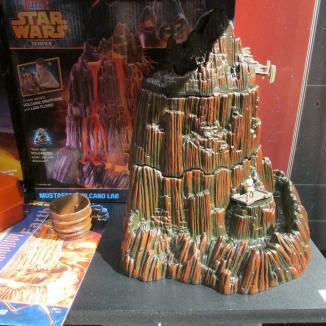 Uncle Milton brings science to a whole new level with the imaginative Star Wars Science collection including this volcano that mimics the ecosystem of the Mustafar planet. We fell in love with the Sensory Tray at Toy Fair as it combines our love of science and sensory learning. The Sensory Tray can be used alone or coupled with the Roylco Educational Light Cube for limitless sensory play and learning. The coolest feature of the sensory tray is that it can vibrate at different speeds leading the way for exciting science experiments. For example, if a child stacks blocks on the Sensory Tray, they will see what happens when the tray vibrates. If shaving cream is used to adhere the blocks together, children will notice a different reaction. This a great introduction to architecture and design. Roylco also provides plenty of experiment suggestions for endless learning fun! We love doing science experiments at Mommy University so we LOVE the kits offered by Scientific Explorer. My kids have really enjoyed the My First Science, Tasty Science and Magic Science kits. Other exciting kits include Electrified Energy Lab, Disgusting Science, Wacky Weird Weather and Crime Catchers Spy Science. At Toy Fair, we were also introduced to the new Ice Age Creator kit where kids can make their own ice and snow! Kids can create their own Ice Age adventure with this new kit from Scientific Explorer. Crayola never ceases to amaze me. 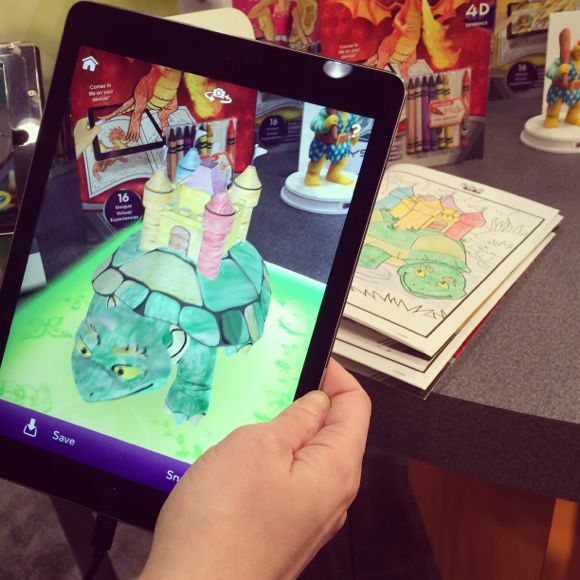 This year at Toy Fair we were introduced to an amazing new product that introduces kids to the world of digital animation and design. With Color Alive Action Coloring Pages, kids can turn their artwork into 3-D creations just by using a FREE and easy to use app. It combines art and technology to create an amazing experience that kids can enjoy for hours! Color Alive brings your coloring page to life! What is more STEM than robots? 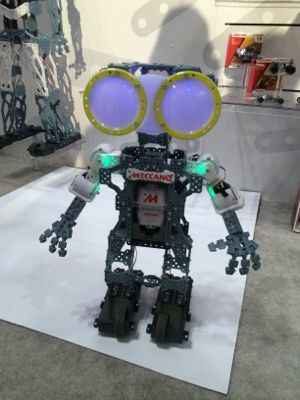 We were amazed by the Meccanoid G15 at Toy Fair. This 2-foot tall robot will be your own personal friend that you can build all by yourself! He uses his “Meccabrain” and voice recognition to follow commands and requests. Owners can use a free app on their tablet in helping to customize their robot to dance, speak, tell jokes and much more! Meccanoids is a wonderful introduction to computer programming and robotics. We hope you enjoyed this look into the amazing world of STEM/STEAM toys! Stay tuned for more Toy Fair 2015 brain boosting toys! Jackson would love the science utility vehicle. A great way to explore this spring.